The message of this song captures The Spiritual Mall's vision of creating a global movement that cultivates kindness one heart at a time. May the words and the music inspire you to take action to do your part to fill the world with love. By purchasing this song, you are helping Point of Light continue to bring messages of light and love to our global family. **BONUS** – when you purchase the full version of this song, we will include the 2-minute version that was featured in our special VideoCard for FREE! Bring hope and healing to those affected by recent world events. MAKE A DONATION by clicking on the icons below. 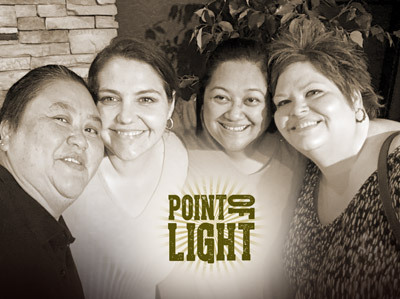 Point of Light is a quartet of lovely, lady BFF HEART-ISTS, who simply love to sing. The diversity of their musical styles, aptitudes and backgrounds is part of what makes their sound so unique. They are known for their multi-part acapella harmonies that can melt you in just a few measures of love. Their shared vision is to be a positive, uplifting, empowering source and force of love through their music and philanthropic endeavors in order to be a positive Point of Light in, as, through and to the world by being the change they wish to see. POL is Heather Dubois, Cerise Patron, Vicky Andam and Babylyne Isa.